This is an updated version of a previous, deleted version: One died of a drug overdose, another with his mistress. One spit on citizens, another made an ex-con jailed for attempted murder his closest aide. All had the power to change the nation and were in line for the presidency. Ryan with fitness guru Tony Horton. A week ago the symbolic gavel banged by the Speaker of the House passed to U.S. Representative Paul Ryan (R-Wisconsin), making him fifty-fifth member of Congress to hold that title. And, before the end of his first full week in that position, he took swift moves to rid lingering memories of two recent predecessors. First, was his first promise to rid the smell of cigarettes from his office rug, sullied by his smoking predecessor John Boehner (R-Ohio), famous for proclivity for public weeping and orange-toned tan face. Boehner’s smoky rug, however, is among the least offensive of kooky legacies left by those who have held this august and powerful position of the legislative branch. Similarly, the worst that can be said of his immediate predecessor, the only woman to hold the job, Nancy Pelosi (D-California), 2007-2011, was that her decisions always met with harsh attacks from not just the opposition but her supporters. Pelosi led San Francisco LGBT Parade. She reflected her liberal constituency in support of women’s choice, marriage equality and marijuana reform but angered many of them for her blocking the 2006 effort by some of her Democratic colleagues to impeach President George W. Bush for misleading the nation into the Iraqi War and civil liberty violations. Of course, not every Speaker of the House has behaved badly either before, during or after holding the job. Some were just some real pieces of work, characters best known by their accomplishments. Short Sam (right) swears in tall Udall. Among the most prominent of these was Sam Rayburn (D-Texas) who held the position in three non-consecutive terms from 1940 to 1961. Rayburn bridged the widening Democratic Party gap between conservative southerners and northern liberals on civil rights by hosting bourbon-fueled poker games in a hidden office. He took no congressional junkets on taxpayer money but paid his own way. Advocating that Route 66 be extended to connect “the Frost Belt with the Sun Belt,” he unwittingly created those regional terms. The worst that can be said of the short, rotund bachelor was how he only donned cowboy hats and boots as a costume when among his poorer, rural constituents, never appearing there in the expensive clothes he was known for in Washington. While Paul Ryan has indicated an eager compulsion to publicly display his gym muscles in the past it is unclear how interested he might be in steeping himself in the lore of House Speakers. With the imminent sentencing of a recent predecessor who pleaded guilty to charges last week, however, the new Speaker’s first housekeeping directive last weekend was to banish a particular oil portrait from “Speaker’s Lobby,” the long, cushy lounge hallway just outside the House floor. Ryan ordered the painting of Dennis “Denny” Hastert (R-Illinois) 1999-2007, “rotated” out of public display, in the wake of shocking revelations predating his Speaker tenure. Last week, the ex-Speaker was convicted on charges of banking illegalities related to hush money for alleged sexual abuse of high school boys he once instructed as a gym coach. A closer look back on the words and deeds of many a forgotten Speakers of the House, however, might soon enough find the walls of “Speaker’s Lobby” blank. And while many names below may be familiar – like Henry Clay, Newt Gingrich, Nicholas Longworth – most will come as a surprise. Here then, a quick, quirky look into the faces, hearts and minds of some audacious, outrageous men the nation once called Mr. Speaker, each marked approximately and appropriately in the partisan red and the blue. For a guy who became the first House Speaker of a new democracy, our very own Frederick the First was decidedly a bit of Old World wunderbar. Among the others listed below, his Germanness is such a mild example that it really doesn’t qualify him as a genuine oddity among House Speakers. A drawing of the first Speaker of the Houses’s house. Son of a German immigrant who established the Lutheran Church in the United States, he went back to Germany for his higher education at Franckesche Stiftungen. Although he claimed to oppose bilingualism of his own first language, stating that “the faster the Germans become Americans, the better it will be,” he abstained from actually voting against it. In a German accent. Nate was all about negation. No, no, no. He hated Alexander Hamilton and he hated the Constitution itself, fearing it would lead to a strong national government. He didn’t want federal money spent on anything, and didn’t want taxes raised – or even state funds. Not on roads, not on public education. He voted against war with France, the Missouri Compromise, Jay’s Treaty, the Alien and Sedition Act, any military draft and funding the navy. Macon’s mansion in the Carolina woods. He was asked to become Postmaster General and said no. He was asked to run for President in 1824 and said no. He was asked again to become Postmaster General and again said no. He was asked to run for Vice President in 1828 and said no. He didn’t want the U.S. trading with England and France when they began causing us trouble. He opposed the tariff, making the vote available to more citizens, or empowering the Supreme Court. Even out of politics, he couldn’t help ranting to President Jackson not to send troops when South Carolina threatened to defy federal rule. Over nearly four decades in Congress, Mr. Negative is believed to have cast more nays than any other member in the history of the United States. Hunter’s ambitions went beyond being Speaker of the House. When he was finally had his name entered as a candidate for the Democratic presidential nomination in 1860, he consistently came in second and then third on the first seventy-nine of eighty ballots. Less than a year after the South had seceded, he accept the post of Secretary of State under the Confederacy, but lasted only five months. Hunter was maliciously critical of Confederate President Jefferson Davis, who sent him to go see President Abraham Lincoln to negotiate a peace treaty, but not before he managed to be sure he’d gotten his face on the Confederate ten dollar bill. He may have been beloved as the “Great Compromiser” when it came to contentious issue of slavery, but just diss the way he dressed and gambled and Henry Clay just might kill you. While serving in the Kentucky legislature, Clay managed to generally avoid the erratically behaving Humphrey Marshall. At the end of 1808, however, with the young nation’s growing concern about its dependency on British exports, Clay prompted a sort of early 19th century Made-In-the-USA campaign. Clay introduced a resolution that every member of the Bluegrass States’s General Assembly must be required to wear only “homespun” clothing to help Kentucky tailors and manufacturers buzzing with work. The proposed measure seemed hypocritical coming from Clay, who was always decked out in fastidious, imported velvets , but true to his word he began showing up in plain, crudely-cut clothes. Marshall considered Clay’s effort to control what his colleagues wore to be the height of arrogance. He became only one of two legislators who opposed the Clay fashion resolution. Further, he showed up in the legislature wearing newly tailored duds made from the finest of British broadcloth. Call him a Kentucky jackass and he just smiled creepily. But a figurative spit on his gorgeous clothes and Clay could kill. Literally. And so he penned a lovely note to Marshall, graciously inviting him to duel on a open field in Indiana, on January 19, 1809. On the first shot, Clay hit Marshall in the stomach. On the second, neither was hit. On the third, Marshall hit Clay in the thigh. With polite disappointment, Clay suggested they try a fourth time. With exceeding thoughtfulness, Marshall backed off, his bluff clearly called, demurring how unfair it would be to shoot at gentleman with a wounded thigh. Neither killing or killed, Clay emerged the fearless, if dangerous winner. It was duel time again. 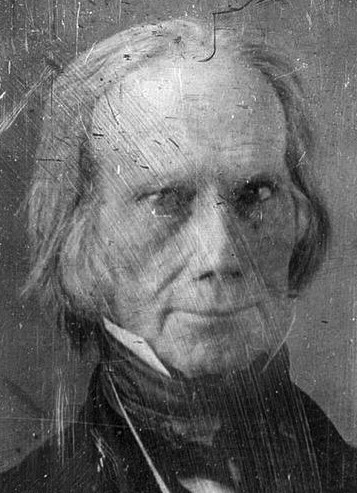 While speaking with “slow and solemn emphasis,” while “pointing directly at Mr. Randolph’s heart, Henry Clay replied, “Mr. Randolph, I thank God that I am no deeper in your debt!” Frightened by Clay’s widening, silent Phantom of the Opera grin, Randolph ran off deeper into dear Virginia and never picked on Clay again. One day in 1844, White the Whig took to the House floor and began wind-bagging endlessly about the virtues of his fellow Kentucky Whig Henry Clay, then running for President. Mercifully, he was finally denied further time to keep on. He had a fit. He wasn’t finished. White launched into a new monologue, ranting on that his first one had been unfairly cut short. Finally, Democratic Congressman George Rathbun yelled out for White to sit down and shut up. With outraged insult, White walked up to Rathbun and socked him in the face. Rathbun returned the gesture with a knuckle sandwich. Within seconds the distinguished members of Congress were brawling wildly. Other Congressmen jumped from their desks to break it up. Someone fired a gun into the congressional cluster but it was a police guard who took the bullet. He never danced with the girl that brung him. Before he became a famous Union Army general who was essentially thrown out of the service for leading a series of epic battle failures, Nate Banks was man not without a party, but a man with four of them. The uniform seems to be all that held up Banks’s military career, proving to be a brief stint between congressional gigs. Starting out as a mill worker, and studying the techniques of public speakers at free Boston lectures, he made his first run for Congress in 1852 as the Democratic candidate. When he refused to disavow his anti-slavery views, the Democrats dumped him. He managed to get himself listed as the candidate of the more obscure Free Soil Party and squeaked out a victory. Once in the job, he came out as pro-abolition which won him enemies among his Free Soil allies. So, when it came time for his reelection he jumped to the Know Nothing Party and won a second time as one of them. Knowing nothing much about his new party’s secret anti-Catholic agenda, a year later he dashed over to the hot, new party of the moment, the Republicans and joined up. Many a hurrah welcomed the election of Banks as House Speaker. Naturally enough a man who changed political affiliations faster than many people in the mid-19th century changed their underwear, there was not a groundswell of loyal party support when Banks ran for House Speaker in December of 1855. In fact, Banks’s battle for the speakership lasted longer than any other in history, a total of two months. There was cheering all through the Capitol when he was finally chosen. After stints as Massachusetts Governor and terrible service during the Civil War, Banks would return to Congress but by the time he was halfway through the three more separate periods in the House, he couldn’t help jumping parties once again, this time finally settling on the one that spoke most naturally to him: Independent. He died of a morphine overdose. Before he was Secretary of State, Presidential candidate, and U.S. Senator, Speaker of the House James G. Blaine established the model for modern political corruption charges. When accused, deny. When proof appears, destroy it. When all else fails, have a breakdown. Blaine’s burning of the Mulligan letters was seen as sabotaging his chance to become President. Democrats had doubts and formed an investigation committee. At recess, Blaine took the clerk to lunch – and left with the letters. Then he just burned them. Harriet and James G. Blaine. Thus, with breathtaking dishonestly, Blaine was enabled to technically declare that he was “truthful” in declaring that no evidence against him existed. Just to be sure the case against him would vanish, Blaine staged a grand finale that managed to not just provoke a wave of sympathy for the great stress the scandal was causing him, but prove his pious purity. A Sunday before he was set to testify before the investigation committee for closer scrutiny, Blaine was strolling with his wife when suddenly, he dramatically collapsed in a state of nervous prostration on the sidewalk in broad daylight. As he was walking out of church. The second foreign-born Speaker of the House and first from west of the Mississippi River, Civil War veteran Henderson was Father of the Meaningless Soundbite, his speeches fusing fiery rhetoric with sentimental corn, “crude eloquence” one reporter dubbed the style. A ribbon during Henderson’s election as Speaker. “God bless the boys!” he would conclude his campaign speeches if children were present (women, of course, could not yet vote), provoking tearful applause from voters who remained bewildered by why they were so emotionally moved. “Stand by the flag!” he’d yell, suggesting it was unpatriotic to vote for anyone but him. If hissed and booed during a speech, he’d snap “Clean ’em up!” prompting supporters to silence the opposition. Henderson shocked the nation by abruptly withdrawing from the 1902 election. Sighing with sacrificial virtue that his principled tariff stance had apparently become unfashionable, sympathizers suspected it was just a noble cover for the real reason of terrible physical pain he’d acquired as a brave war hero. Then a clerk revealed the real reason for his hasty retreat from public adulation. His wife build them a castle on a hill high enough to look down on the White House and spent the rest of her life trying to get the government to buy it as an official vice-presidential residence. His mental health rapidly deteriorated, likely a brain disease but unproven to be the reason for his non-sequitor exhortations. He smoked, drank and yelled out obscenities all throughout the workday, and he didn’t give holy hell who didn’t like it. He got away with it because he also coalesced and used power perhaps more effectively than any other House Speaker, obstructing whatever he didn’t like. Uncle Joe’s signature Civil War era beaver hat, worn well into the 20th century. A good part of what inspired perhaps history’s most infamous House Speaker, “Uncle Joe” was inspired not just by principal but persona. He loved the publicity and fear his presence could generate. He made sure people never forgot him. They didn’t. One day in August of 1890 during a debate on how the dairy industry could be damaged by margarine production Uncle Joe’s words was so vile that he rendered the stunned incumbent Speaker Tom Reed unable to slam his gavel and call for order. Each time a Congressman arose to argue with Cannon, he’d fire off an insult using just enough profanity to silence them. Not so New Jersey Democrat Willliam McAdoo, who began cursing him back. Old Uncle goes a whisker-trimming – cigar in mouth. It quickly escalated into a foul-mouthed shouting match. A Tennessee Congressman feared for the virtue of women tourists listening in from the visitor’s gallery and called for its emergency evacuation. “The ladies in the gallery were horrified and beat a hasty retreat, while the gentlemen on the floor blushed with shame,” the Atlanta Constitution reported. Finally, once the halls cleared of all citizens, all the obscenities were cleared from the day’s verbatim Congressional Record and the session adjourned. Speaker Cannon made his point clear to Congress by megaphone. Tourists were warned not to be standing between Uncle Joe and any of the brass spittoons lining the floor. Without regard to their status as either common citizens or fellow legislators when he had to spit a a long-range shot of a mouthful of chewing tobacco, he had to spit. He not only chewed tobacco, but smoked his pipe and multiple cigars each day. Starting morning with a fresh, new big one. There was method to Uncle Joe’s madness. “It is easier for a politician to get along with the reputation of a sinner than with the reputation of a saint,” he confessed. His nicotine addiction, however, served the more subversive purpose of masking the intense stink of whiskey on his breathe. Uncle Joe never ventured to the House floor without one of his silver flasks, freshly filled to the brim each morning with bourbon. It’s hard to say whether Speaker Cannon loved his smokes and booze more than the publicity he got for indulging them. Uncle Joe works his 1899 social media. Preceding by a century Trump’s hair, Carson’s Bible tales, Hillary’s pantsuits, or Jeb’s bilingualism were the looney publicity photographs that he loved posing for around the Capitol Building and having widely printed in the nation’s newspapers and magazines. “The cut of a congressman’s whiskers or his clothes is a better subject for a human-interest story than what he says in debate,” he admitted. To some, he was a stinky, foul-mouthed old goat; to others he was a beloved institution. “I am goddamned tired of listening to all this babble for reform!” House Speaker Cannon once crowed with pride in his opposition to labor protection laws, food safety regulations, and a woman’s right to vote. “America is a hell of a success,” he affirmed. Strange bedfellows: Senate wife Mary Borah (in white), who’s husband fathered the child of Alice Longworth (center), seated with Nick and his trademark gold-topped cane. A classic violinist, his rare and valuable Stradivarius did matter to him. He also liked his liquor and poker, publicly debauched on occasion according to one of his crony’s wife. And women. During an Asian junket, the bachelor Congressman got chummy fast with teenage celebrity presidential daughter Alice Roosevelt, culminating in a lavishly gargantuan 1906 White House wedding. Longworth was a loving, if elderly father. The couple pursued adultery equitably, and Nick never resented that a Senator, not a Congressman, fathered his wife’s child. He was in on the political swapping too, counting at least one congressional wife among his numerous lovers. When a colleague once rudely rubbed Nick’s smooth, bald head while cracking, “Feels just like my wife’s bottom!” the Speaker calmly confirmed this, “Yes, so it does,” he smiled back. He was with one of his mistresses when he died. William B. Bankhead may well be best remembered for being the father of the madcap, raspy-voiced, cocaine-addicted, cigarette-smoking, sexually-adventurous, champagne-guzzling, southern-drawling actress Tallulah Bankhead. Bankhead was nothing like his daughter, but he lovingly indulged and quizzically endured her eccentricities. During the Great Depression, Miss Bankhead thought nothing of sailing past citizens seeking help with housing, jobs and food, and into the House Speaker office suite to surprise “Daddums,” swathed in furs and dripping in diamonds. Acquiescing to Tallu’s pouty plea to gallivant along with him to Chicago for the 1940 Democratic National Convention, was apparently more than he could take. Just before delivering a keynote address on behalf of President Roosevelt’s controversial third term, he fainted. He was dead five days later. His predecessors Joe Cannon and Tip O’Neill were the first two former Speakers to write memoirs, but Jim Wright made hay while the sun shined, getting Reflections of a Public Man published while still serving as Speaker. Wright’s book sold like hotcakes until a House Ethics Committee discovered that he was ordering bulk sale of the book to be included in the cost of tickets at his speaking gigs as a way of making more money than congressional rules permitted. He also found a way to get free travel and gifts by arranging for his wife Betty to take a job in title only, and have all the perks funneled through her. Another family connection proved more scandalous. Wright hired the brother of his son-in-law John Mack as his closest aide. Two years into Wright’s Speakership, however, came revelations that he had pulled strings to get Mack’s fifteen-year prison reduced to just two years and three month and protected him from media scrutiny. Mack had pleaded guilty to attempted murder of a woman store clerk, stabbing her body, hammering her skull and slashing her throat. Mack resigned, Wright soon followed, the first House Speaker to do so. Ruthlessly ambitious in plotting his political rise, Newt Gingrich filed the original charge that led to Jim Wright’s resignation and cleared the way for him to seize the speakership. With similar tactical calculation, his first wife Jackie Battley claimed that he abruptly announced he was divorcing her while she was hospitalized with cancer. “She’s not young enough or pretty enough to be the wife of the President,” Gingrich told his campaign treasurer. He was also having an adulterous affair with one Marianne Ginther, and six months after obtaining his first divorce, he married his mistress. Gingrich with his second mistress – who became his third wife. His second wife went on to co-author two books with him and get him out of debt. He went on to have an affair with a congressional staff member Callista Bisek and then proposed an “open marriage” to his second wife. She refused. He divorced her. Gingrich’s finest moments were pushing for President Bill Clinton’s impeachment, charges of which stemmed from his adultery, and forcing a shutdown of the federal government. House Speaker Gingrich behind his nemesis, President Clinton. When Gingrich claimed to a Christian Science Monitor reporter, however, that his being told to exit the back door of Air Force One during an overseas trip with Clinton was a reason why he became so uncompromising on federal budget negotiations with the President. Using a personal snub as a reason for grinding the government to a halt left Gingrich looking childish and vindictive, further worsened when video showed him walking out the front door, right behind Clinton. Endless ethics violation charges resulted in Gingrich becoming the first Speaker to be reprimanded by the House for doing so. He was ordered to reimburse the House for a third of a million dollars to cover some of the expensive investigations, and found to have lied in the evidence he submitted to prove his innocence. Some politicians of all stripes, from all countries it seems believe in the same creed, “Do as I say, not as I do!” One particular politician’s misdeed I recall from a Canadian History course I took at university was when a French Canadian government official caught pocketing the interest of the provincial treasury in the late 19th century was asked by a judge why he would attempt such an brazen theft. In his defence he replied, “It is a poor keeper of the honey pot who does not take a taste of the honey!” And the beat goes on!